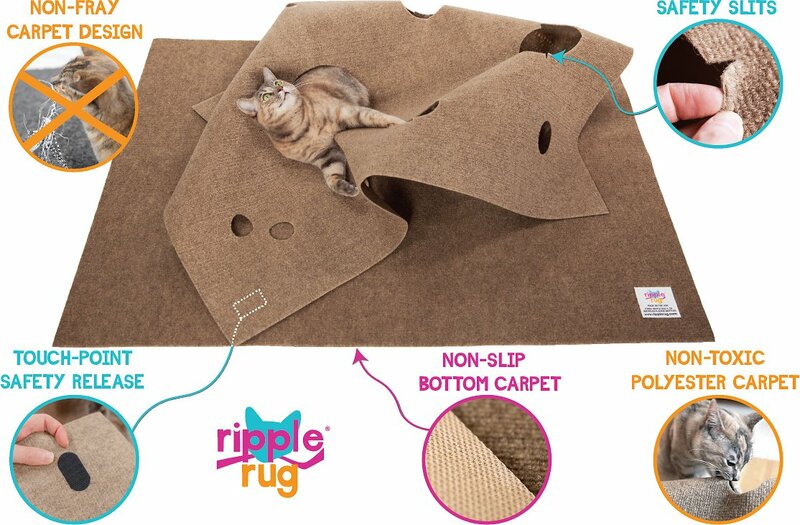 If you’re looking for the purr-fect way to please your furry pal, give him the ultra-fun play space he deserves with the SnugglyCat Ripple Rug Cat Activity Play Mat. 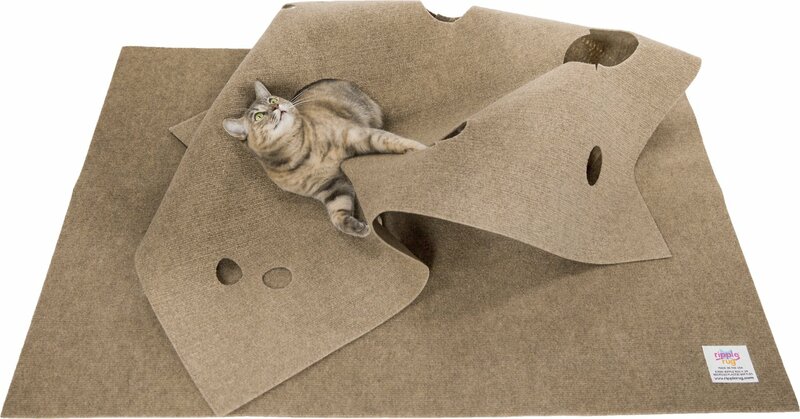 This all-purpose play mat makes ripples in kitty entertainment because it’s built to satisfy a range of natural cat behaviors, including scratching, stalking, pouncing, hiding and nesting. 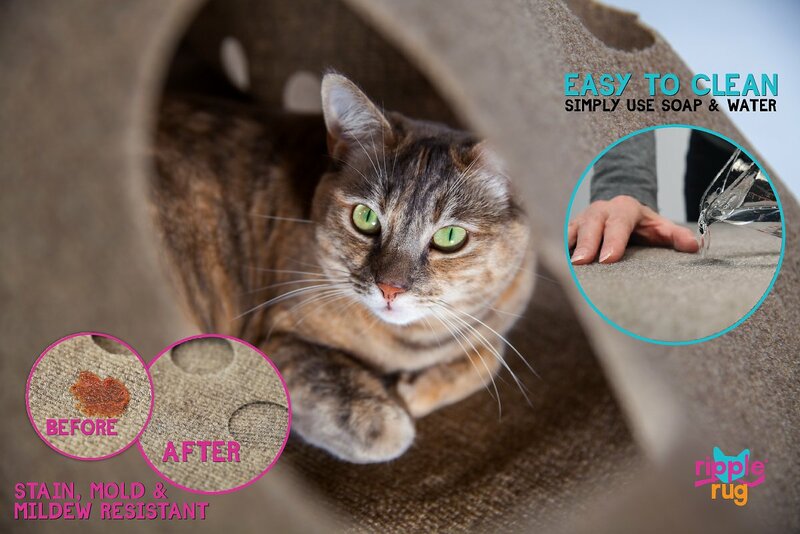 Its durable carpet fibers are perfect for digging claws into it—while sparing your furniture—and the holes and folds provide interactive play for your pal, with you or while you’re away. Plus, its cozy design with a thermal base makes a comfy bed for more quiet moments and catnaps. Thanks to its fur-trapping action, it also helps you tame loose fur and dander by keeping it on the mat. 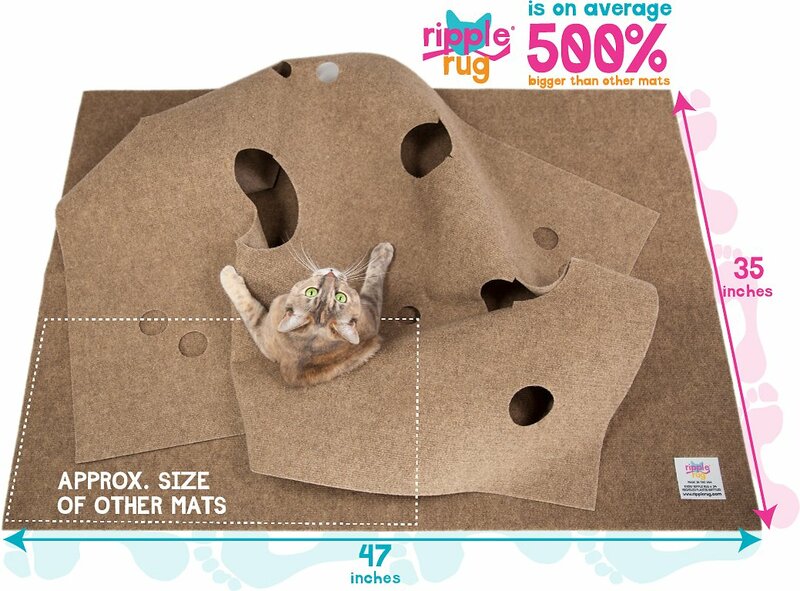 And if you have more than one feline pal, this activity mat is large enough to accommodate multiple cats and promote healthy play and social behaviors. Play mat, scratching spot, social activity, and cozy bed all in one. Folds and holes provide interactive, enriching play and support primal cat behaviors. 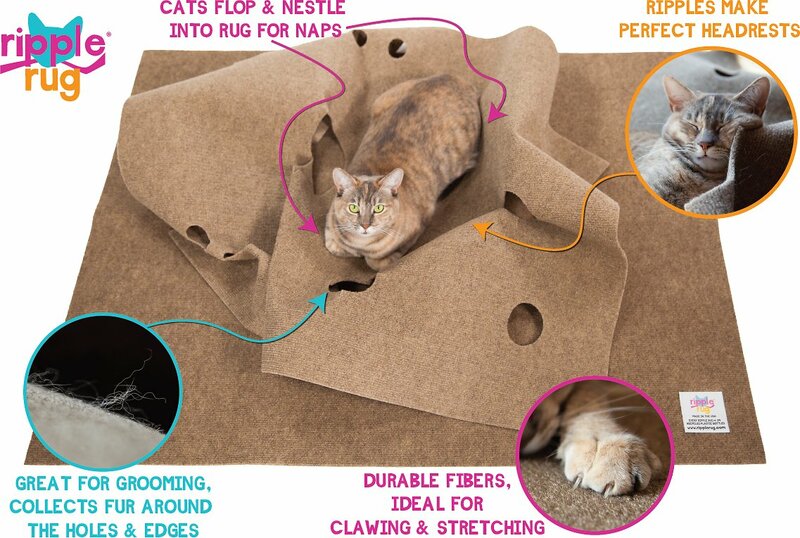 Durable carpet fibers are perfect for digging claws while sparing your furniture. Provides a comfy bed with thermal base and collects loose fur from shedding. Proudly made in the USA and folds away for easy storage and take-along. The safety slits allow larger cats to fit through holes. Safety slits can be extended with a pair of scissors if needed. Supervised play is recommended. Always use top and bottom together to ensure safety, top may be slippery if used alone. Touchpoints are designed for ultimate cat safety. Touchpoints employ a safe fusion technology. If a cat should come under extreme duress, touchpoints are designed to release to ensure your cat's safety. If for any reason a touchpoint should release, they can be easily reattached. Please do not attempt to manually peel off Touch-points. It is possible for humans to pull them off; a child safety mechanism. Released touch-points are not sticky, this too is a safety measure. They won't get stuck to your cat's fur or bottom of your foot. Unfold both rugs, lay flat and vacuum when new. Place the rug coated with non-slip surface onto the floor. Next, position the other rug with holes over the top, use the fuzzy fastener touch-points to shape ripples. Touch-points can be attached by pressing them down to any spot on the bottom rug. To release, pull up on the top carpet at any time. You may reshape the carpet as often as you like. To create reinforced arch, fold the long edge of the top rug (next to center touch-point) - twice. Ensure that the touch-point's burrs make contact with the carpet fibers. Next, press down corner touch-points on either side of the fold to make arch. Cleaning: A sticky roller or vacuum can help remove fur when needed. Use soap and water for other nasties. Rinse using a garden hose. Hang flat to dry. Do not tumble dry. The cats do love this thing. I can't readjust the top part with the cats in the room, as they immediately dive in and try to attack my hands. It mostly gets laid on as a mat, though. It just doesn't stay popped up enough for them to tunnel into it for very long after I've set it up, even with rolling the edges over, as suggested in a video. And as soon as one cat is underneath, the others jump on top of them. It's most fun to hide toys underneath the folds for the cats to hunt. The velcro tabs start to fuzz up the carpet base after awhile. The cats also like to scratch on it, which is further fuzzing the material. I read reviews of this item before purchase so I was aware of some of the reported short comings but was hopeful because of all the positive reviews. This is a great idea and the cats do enjoy it - until the top rug collapses as it will do. If they could just stiffen that rug a little it would be great. It's very hard to try to manoeuver that rug so it will stay up. This may end up being a gift to the local shelter. My cat is what you'd call a "bush dweller," as opposed to a "tree dweller" (I know, I watch too much Animal Planet!). She's had no interest in any cat tree I've purchased, and she's scared of any motorized toys. This Ripple Rug is her FAVORITE thing in my apartment. She adores it -- and even though she's used it every single day for months (even sleeping in it), the top rug hasn't lost its stiffness. I think that's because I vacuum it and change its configuration regularly. Washing seems to help, too. Bottom line: I'm so glad I got this for her. Highly recommended! I'm so glad I got this. We used to have our cats play in packing paper, and this is much cleaner. Our cats love digging and playing with toys in and around this mat. Frida practically stayed on this mat the first two days we had it. You can set it up in all kinds of configurations, so it keeps them interested and it encourages them to stay away from "playing" with your throw rugs. I bought this mat hoping to distract my cat from tearing up the new area rug I had just purchased. He practically destroyed the rug before the bill even came! Buddy is a large yellow tabby. He likes to lie on the mat, and claw on it. I encouraged him a lot when he started clawing on it, versus reprimanding him when he clawed the rug. He doesn't go under it, or come out the holes, which I would have to enlarge considerably anyway, but he does hang on it, which is great. A little relief for the rug. I bought the Ripple Rug right after Christmas for my two lazy Ragdolls since they weren't impressed by any of the mountain of toys I bought them for Christmas. At first both girls were intimidated by this new "rug", but soon my fat girl, Zoey, decided to lay on top of it and claim it as hers. Cleo just watched, which is the norm around here. As soon as Zoey found other things to entertain her,(food), Cleo took her turn lounging on top of the mat. Finally, after adding dozens of toys and spreading a ton of catnip inside, Zoey crawled in to one of the tunnels I had set up and took a long nap, while Cleo sat outside waiting for her turn. It's a win for them! Our cat LOVES this rug! We bought it because he keeps scratching and pulling up the carpet, and it's successfully replaced the scratching that was happening on the carpet. However, we didn't anticipate him loving it as much as he does! His first move whenever he wants to play is to dive into the tunnels. It's adorable, and he entertains himself. Highly recommend. We have a 6 month old Bengal kitten that is VERY active. He's only got two modes, on or off. We've been looking for more interactive toys and came across ripple rug. I received it yesterday and set it up this morning. He's been going for a full hour with no signs of slowing down. We put toys in a bunch of the holes and he's been all about it. Definitely worth it for us!